. – MALAWI ALERTS : – .
. AVOID DRIVING IN THE DARK. Trucks, Cars, Tractors with no lights and/or reflectors are all too common. Every year we lose friends who hit into broken down and stationary vehicles. ….
. Drive Safely. Have a wonderful trip. Enjoy Malawi …. Visas Useful Phrases in Malawi Weather What! Need to know more? Malawi (also known by its former name Nyasaland), is a stunning country in South East Africa bordered by Zambia, Tanzania and Mozambique. A third of Malawi consists of the majestic Lake Malawi (the twelfth largest freshwater lake in the world), and the Great Rift Valley runs through Malawi from the North to the South. Spectacular features of Malawi will include Mount Mulanje, Lake Malawi and The Zomba Plateau. Malawi has evergreen forests, a prosperous diversity of flora and fauna, indigenous animal life that includes Big Cats, Hippos, Elephants, Monkeys, Bats and a variety of Birds such as parrots, falcons, waterfowl, owls, songbirds, birds of prey and large waders. The main flora of Malawi is the savannah woodland. Tourist attractions for Malawi will include the beautiful 9 National Parks and Wildlife Reserves, The Mulanje Massif, The Chongoni Rock Art Area, The Lujeri Tea Estate, The Zomba Plateau, Lake Malawi, St. Peter’s Cathedral, St Michael and All Angels Church, The World War 1 Memorial, The Kumbali Cultural Village and various Museums and Art Villages. Activities to do in Malawi will include Hiking, Fishing, Mountain Climbing, Bird Watching, Diving, Snorkeling and much more. The Malawian flag consists of three black, red and green horizontal stripes with a red rising sun in the center of the black stripe. The black stripe represents the African people, the red stripe represents the blood of the martyrs for African freedom, the green stripe represents Malawi’s ever green nature and the dawning sun represents the dawn of freedom and hope for Africa. In addition to being the largest city in Malawi, Lilongwe (named after the Lilongwe River) is the capital city of Malawi and Blantyre is Malawi’s commercial centre. Malawi’s official language is English and the primary language for Malawians is Chichewa. Chili Kuti is Chichewa for Where is it? Malawi earned its nicknames “The Warm Heart Of Africa” and “Africa for Beginners”, through its compassionate environment, hospitality and its people being welcoming, courteous and supportive. Malawian people are very attentive to good manners and love it when tourists speak to them in their own language, so if you want to make a friend for life, all you have to do is just learn a few words of Chichewa and greet them in their own language. Crime is present in Malawi, but violent crime is rare and in general, Malawi is considered a safe country for tourists however tourists are advised to take the normal and usual travel precautions when traveling to any destination. Majority of Malawian religion is Christian. Malawi has a rich culture of music and dance that forms a vital part of the Malawian lifestyle and there are over 100 traditional dances in Malawi. There are many dance troupes and performances, traditional ceremonies, celebrations and festivals that occur throughout the country that is worth watching for tourists. The Malawian national dance troupe is called the ‘Aka Kwatcha’ and has been performed all over the world. Malawi has a well-heeled tradition of basketry, wood carving, pottery making and mask carving, and tourists love buying the items and the hand-painted pieces that simulate beautiful landscape scenes and ordinary life scenes of Malawian people. When you are packing your clothes for your holiday in Malawi, keep in mind that people in Malawi likes to dress informal and swimwear and revealing clothing should only be worn at the beach resorts. If you are going on safari, colours like beige and brown should be worn instead of bright or light colours. If you are going to Malawi in the winter (April – September), its best to pack warm clothes for the evenings and early mornings. The standard Malawi time is GMT+2. In the major centers of Malawi, there are many acceptable hotels. Whilst the standards, service and quality is not always to Western levels, they are mostly very acceptable indeed. Bed and Breakfasts (BnB, Guest Cottages and Small Guest Lodges are prolific (especially in Blantyre and Lilongwe) and are pretty good value for money. There are no Dormitories type of Accommodation available in Malawi. There are many Lodges around Malawi, particularly around the Lake Malawi towns of Salima, Mangochi, Monkey Bay, Cape Maclear and Senga Bay and they are particularly welcoming to Backpackers. If you like camping and want a South African kind of camping ground/caravan park, you are out of luck. Some of the Country clubs allow camping on their sites as do some of the Lodges and resorts. Camping in the open is seldom fun in Malawi, unless you enjoy being the focus of spectator sport. The local kids will appear from nowhere to enjoy the spectacle of “rich foreigners” crazy enough to choose to sleep in a tent. Overall, Malawi is a great destination to go on holiday and there are many things to see and do. The currency used in Malawi is the Malawian Kwacha and US Dollars and Travelers Cheques are also accepted throughout Malawi. You can click on the link for the current rate check www.xe.com. Malawi has a developed but not very extensive banking network. Within major centers one can find many ATM’s and banks, but it is worthwhile to stock up with cash before venturing to outlying places. Banks in Malawi are open weekdays from 08:00am to 13:00pm. Whilst more and more establishments in Malawi are now accepting debit and credit cards, one cannot rely on it. Keep cash in reserve. Malawi has a very diverse cuisine. The most popular cuisine dishes for Malawians are their staple food Nsima (porridge made from ground corn) with Chicken / Beef / Kampango / Fish like Chambo, Usipa and Mpasa from Lake Malawi served with Vegetables and Tea. There are various popular street foods like Mandasi (deep-fried sweet fritters), Kanyenya (barbecued meat or fist) and Chiwaya (chips and chicken / pork / beef) available throughout Malawi. Vegetables and Fruits such as Mangoes, Melons, Oranges, Bananas and Pineapples are available in Malawi. There are various soft drinks such as Coca-Cola and Alcoholic beverages such as Beer (Carlsberg most common), Spirits (Malawi Gin) and South African Wines available at reasonable prices in Malawi. It is advised to rather drink bottled water than tap water in Malawi. Malawi has 31 Airports of which 7 has paved runways and 24 has unpaved runways. The two international airports in Malawi is the Kamuzu International Airport in Lilongwe and the Chileka International Airport in Blantyre. Malawi has narrow-gauge Railways and Roadways in various conditions (paved and unpaved). There are Waterways on Lake Malawi and the Shire River. Public transport in Malawi is available via Axa busses and minibuses that will travel almost anywhere in Malawi. The Malawian communication infrastructure caters for cell phones, landline telephones, internet connections, radio, television and postal services. There are three mobile phone networks in Malawi namely TNM, Access and Airtel and tourists can buy sim cards relatively cheap for any of the mobile networks. Coverage is fair to good in most parts of the country. The land line service is barely adequate. If a site lists a cell phone as well as land line numbers the mobile number will normally be better, especially outside the main cities. Data rates are expensive so endeavour to do downloads and updates when WI-Fi is available. Malawi has 20 television stations that is broadcasted on the country’s digital network MDBNL and there are English language radio broadcasts available. The postal system in Malawi can be very slow but international courier company DHL is operational in Malawi. Electricity supply in Malawi is 220 – 240 volts running at 50Hz. Type – G plugs (“British type” square bayonet three-pin plugs) are used. Malawi has been suffering major electricity supply problems lately. It is advisable to bring plenty of batteries as they are expensive in Malawi. Ensure that you have a car charger for your cell phones, lap tops, tablets etc. as you can’t assume that there will be electricity at your next stop. Not even if it is a major city. There are large supermarkets and shops available in Blantyre and Lilongwe for tourists looking to do some shopping. There are small supermarkets, markets and roadside vendors available in towns and villages throughout Malawi. Malawian people expect bargaining at the markets, so tourists shouldn’t be afraid to bargain on item prices in the markets. The Liwonde National Park (also known as the Liwonde Wildlife Reserve) is located in the south of Malawi and is 580sq km big. The park was founded in 1973. The park offers fabulous game viewing with the Shire River that flows along the western border of the park and some of the wildlife in the park includes Hippos, Buffalos, Elephants, Leopards, Zebras, Crocodiles, Hyenas, Antelopes such as Waterbuck, Kudu, Eland, Hartebeest, Sable, Duiker, Impala, Bushbuck, Black Rhino’s, Baboons, Monkeys, Warthogs, Cheetahs and Lions. The park hosts many varied bird species, some of which includes Fish Eagle, White-starred Robin, Lilian’s Lovebird, Brown-headed Parrot, Weaver Birds, African Skimmer, Pel’s Fishing Owl, Southern Ground Hornbill, Saddle-billed Stork, Brown-breasted Barber and many more. The park offers first class accommodation in lodges and camp sites. Activities to do in the park will include Game Viewing, Game Drives, Bird Watching, Boat Safaris on the Shire river, Hiking Trails and 4×4 Routes. The best time to visit the park is during the dry season from April to October. The Liwonde National Park is open from 06:00am in the morning to 18:00pm at night. For more information you can email African Parks – Liwonde on [email protected], visit their website on www.african-parks.org or contact them on +265 (0) 99 317 0829. The Nkhotakota Game Reserve (also known as the Nkhotakota Wildlife Reserve) lies beneath the Chipata Mountain in the central region of Malawi and has various rivers flowing through it and most of the reserve is miombo woodland. The reserve is 1800sq km big and wildlife in the reserve includes several Antelope species, Leopards, Buffalos, Elephants, Lions and many other game species. The reserve hosts various bird species including Giant King Fishers, Palm Nut Vultures and many more. Accommodation in the park will include lodges and camping sites. Activities to do in the park will include Game Viewing, Walking Safaris, Climbing, Bird Watching and Fishing. For more information you can email African Parks – Nkhotakota on [email protected], visit their website on www.african-parks.org or contact them on +265 999 965 043. The Majete Wildlife Reserve is located in the South West of Malawi in the Lower Shire Valley and is 700sq km big. The reserve is a Big Five destination and wildlife in the reserve includes Lions, African Elephants, Black Rhinoceros, African Buffalos, African Leopards, Antelopes such as Eland, Reedbuck, Impala, Nyala, Duiker, Sable, Waterbuck, Hippos, Monkeys, Warthogs, Zebras, Tortoises, Crocodiles, Leopards and many more. Bird species in the reserve includes Golden Silk Orb-weaver, Egyptian Goose, African Finfoot, Racket-tailed Roller and many more. For Accommodation, the reserve offers a luxury tented camp and community campsite. Activities to do in the reserve will include Game Viewing, Bird Watching, Game Drives and a visit to the Kapichira Falls. For more information you can email Majete Wildlife Reserve on [email protected], visit their website on www.majete.org or contact them on +265 999 521 741. The Nyika National Park is located in Northern Malawi in the Nyika Plateau. The park was named Nyika as Nyika means “where the water comes from” and the park is located in the Nyika Plateau. The park is beautiful with various orchid flowers and wildflowers over the grasslands. The park is 3200sq km big and wildlife in the park includes Elephants, Antelopes such as Eland, Roan, Duiker, Lions, Zebras, Lions, Leopards, Warthogs, Hyena, Porcupines, Bushpigs, Jackal and many more. Bird species in the park will include Denham’s Bustard, Red-winged Francolin, Wattled Crane and many more. Accommodation in the park will include log cabin lodges and camp sites and facilities. Activities to do in the park will include 4×4 Excursions, Fishing, Game Viewing, Mountain Biking, Game Drives, Walking, Horseback Safaris, Bird Watching, Trekking, visiting the Chisanga Falls, the Neolithic Rock Shelter, Trout Pools, Waterfalls and the Magic Lake. The Lengwe National Park is near Chikwawa in Malawi and is 900sq km big. Wildlife in the park includes Spotted Hyenas, Antelope such as Nyala, Impala, Duiker, Kudu, Bushbuck, Reedbuck, Livingstone’s Suni, Warthogs, Monkeys, Buffalos, Baboons, Bush pigs, and many more. Bird species in the park includes Shrikes, Yellow-spotted nicators, Rollers, Bee-eaters and many more. Accomodation in the park is the Nyala Lodge. Activities to do in the park includes Game Viewing, Game Viewing through the built hides overlooking the water-holes, Bird Watching, Walking and Visiting the Tisunge heritage centre and the Lower Shire Heritage centre. The breath-taking Lake Malawi National Park is the world’s first freshwater park with various marine animals and is located south of Lake Malawi and infuses the spectacular World Heritage Site Cape Maclear. Wildlife in the park will include Baboons, Antelope such as Duiker, Impala, Kudu, Leopards, Hippos, Elephants, Warthogs and many more. Bird life in the park will include Fish Eagles, Hamerkops, Cormorants, Hyrax and many more. Fishes to be seen in the transparent waters of Lake Malawi would include Cichlid, Mbuna Rock Fish, Chambo, Usipa, Mpasa and many more. There are various lodges and romantic island hideaways available for accommodation in the park. Activities to do at the park would include Game Viewing, Bird Watching, Bike Rides, Boating, Safaris, Boat Cruises, Snorkelling, Swimming, Game Excursions, Game Drives, Diving and Canoeing. Malawi has central hospitals, regional and private facilities. Vaccines and medicines recommended for safe travel to Malawi will include Hepatitis A and B, Typhoid fever, Cholera, Rabies and Malaria. Malawi has one of the highest incidences of AIDS in the world, thus its important to exercise regular universal precautions when dealing with any bodily fluid and wear rubber gloves when dressing other adults and children’s cuts. There is a variety of infectious diseases present in Malawi such as Diarrhea, Polio, Tetanus, Plague, Schistosomiasis and Bilharzia (if bathing in- or drinking water from some parts of Lake Malawi), thus for your own health and safety, avoid swimming or always ask locally before swimming in fresh unchlorinated water, such as lakes, ponds or rivers or drinking water (non-bottled) from lakes. There is a risk of malaria when traveling to Malawi, so it is best to take anti-malarial prophylactics. Precautions that you can take to avoid getting infected with Malaria will include sleeping under mosquito nets, using mosquito repellent on the skin, burning mosquito coils and wearing long sleeved clothing and long trousers in the evenings. When going on walking/hiking safari trips, keep in mind that snakes and scorpions are common in the bush and long grass, and most of their bites are on the foot or lower leg, thus it is advised to wear proper boots with long trousers and thick concertinaed hiking socks. Always remember to shake out your shoes before wearing them again. If you should get bitten or stung, please stay calm and keep in mind that many bites and stings are non-fatal, thus try to identify the culprit and then get medical attention as quick as you can. It is extremely important to visit your doctor ideally 4-6 weeks before your trip to get your vaccines or medicines you may need. These health tips are just a guideline; thus, we recommend that you always seek up to date advice from your doctor before traveling to any destination. CDC recommends this vaccine because you can get hepatitis A through contaminated food or water in Malawi, regardless of where you are eating or staying. You will need to take prescription medicine before, during, and after your trip to prevent malaria. Your doctor can help you decide which medicine is right for you, and also talk to you about other steps you can take to prevent malaria. 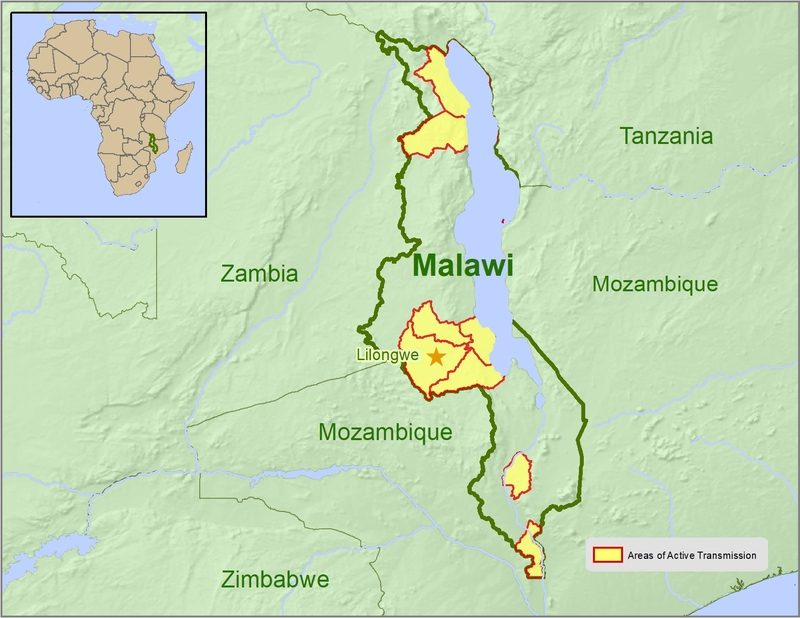 See more detailed information about malaria in Malawi. You can get typhoid through contaminated food or water in Malawi. CDC recommends this vaccine for most travelers, especially if you are staying with friends or relatives, visiting smaller cities or rural areas, or if you are an adventurous eater. CDC recommends this vaccine for adults who are traveling to areas of active cholera transmission. Areas of active cholera transmission include the districts of Blantyre (last case reported February 2018), Dedza (last case reported April 2018), Dowa (last case reported February 2018), Karonga (last case reported April 2018), Kasungu (last case reported January 2018), Likoma (last case reported April 2018), Lilongwe (last case reported May 2018), Mulanje (last case reported January 2018), Nkhatabay (last case reported January 2018), Nsanje (last case reported April 2018), Rumphi (last case reported April 2018), and Salima (last case reported June 2018) in Malawi (see map). Cholera is rare in travelers but can be severe. Certain factors may increase the risk of getting cholera or having severe disease (more information). Avoiding unsafe food and water and washing your hands can also prevent cholera. There is no risk of yellow fever in Malawi. The government of Malawi requires proof of yellow fever vaccination only if you are arriving from a country with risk of yellow fever. This does not include the US. If you are traveling from a country other than the US, check this list to see if you may be required to get the yellow fever vaccine: Countries with risk of yellow fever virus (YFV) transmission. For more information on recommendations and requirements, see yellow fever recommendations and requirements for Malawi. Your doctor can help you decide if this vaccine is right for you based on your travel plans. Learn actions you can take to stay healthy and safe on your trip. Vaccines cannot protect you from many diseases in Malawi, so your behaviors are important. Bugs (like mosquitoes, ticks, and fleas) can spread a number of diseases in Malawi. Many of these diseases cannot be prevented with a vaccine or medicine. You can reduce your risk by taking steps to prevent bug bites. Use an appropriate insect repellent. For more information on how to stay safe during your travel to Malawi, please see the following page: Staying Healthy and Safe in Malawi. Use the Healthy Travel Packing List for Malawi for a list of health-related items to consider packing for your trip. Talk to your doctor about which items are most important for you. There are no notices currently in effect for Malawi. Please note that when traveling on Malawian Roads, driving is on the left-hand lane of the road. All road traffic signs in Malawi are in English. The speed limit inside built up areas in Malawi is 50 km/h (30 mph) and the speed limit outside the built-up areas in Malawi is 80 km/h (50 mph). HOWEVER, there are frequently no signs warning that one is entering or leaving a built-up area. This will not stop the police from fining the unwary motorist. The problem is made worse by the absence of definition of a “built up area”. We recommend that if you approach an area where there are several huts close to the road that you drop to below 50 Km/h. Similarly, the absence of other road signs and/or markings will not stop the police from fining you if you inadvertently break a law. Drive carefully and when in doubt, obey any law that may apply. One should have triangles, high viability vests and at least on fire extinguisher per vehicle. On occasion the police will insist that you have your name and address pasted to the inside of your windscreen. Fuel stations are far apart from each other, so please ensure you fill up your vehicle as often as possible to prevent getting stranded without fuel. It is advised to use toilets that are available at fuel stations when you stop to fill up your vehicle, as the next toilet might be very far from your current stop. Remember to take toilet paper with you as some toilets might not have toilet paper available. Be careful of unlicensed and unroadworthy vehicles and local people walking on the roads especially when driving at night in Malawi as there are very few street lights. Some roads in Malawi are well maintained while others are not, so be careful when driving and watch out for potholes. While on vacation in Malawi you can visit the Spectacular 9 National Parks and Wildlife Reserves, The Majestic Lake Malawi, The Chongoni Rock Art Area, The Grandeur of Mount Mulanje, The amazing Zomba Plateau, The Lujeri Tea Estate, St. Peter’s Cathedral and many more. Activities to do in Malawi includes Hiking, Fishing, Swimming, Mountain Climbing, Game Viewing, Bird Watching, Diving, Various Safaris, Snorkelling and much more. Mount Mulanje (also known as The Mulanje Massif) or as locals would call this majestic mountain, “Chilumba mu mlengalenga” meaning “island in the sky” is located in the south eastern region of Malawi, covering an area of 650sq km and its highest peak Sapitwa, is the highest peak in southern central Africa at 3000 metres above sea level. J.R.R Tolkien visited Malawi in the 1930’s and when he saw Mount Mulanje and the great rift valley with its amazing free-standing eroded monadnocks and inselbergs, it moved and inspired him to write the epic trilogy “The Lord of the Rings” making him and Mount Mulanje famous. On your way to Mount Mulanje you can see the beautiful tea estates and most of them like Satemwa Estate, Lauderdale Estate, Esperanza Estate and the Lujeri Tea Estate offer tours and free tea tasting trips for tourists. The Mount Mulanje area is a biodiversity hotspot as it hosts over 500 unique animal and plant species. Hiking to Mount Mulanje is an unforgettable event as you follow the hiking trials and see the beauty of the area and the popular Likhubula waterfalls and pools. Accommodation on Mount Mulanje is available in 10 mountain huts with spectacular views and all huts provide basic amenities for a comfortable stay. Activities to do on Mount Mulanje will include hiking, attending the Mount Mulanje Porter’s Race every July, Tea tasting and tours and much more. The breathtakingly beautiful Lake Malawi (also known as Lake Nyasa) was discovered by Dr David Livingston over 150 years ago and is the 9th largest lake in the world, the third largest lake in Africa and is 580 km’s long, 80 km’s wide at its widest point and has approximately 1500km’s of shoreline with beautiful golden beach sand. The total surface area of Lake Malawi is about 29,600sq km and its mean depth of 264 meters and its maximum depth of 701 meters makes it the 2nd deepest lake in Africa and the 6th deepest lake in the world. The lake is a meromictic lake (water layers do not mix) with three layers with different densities, the freshwater is warm and, in most places, crystal clear allowing you to see the beauty and assortment of the over 700 species of Cichlids and all the other different fish in the lake. Very popular tourist attractions are the spectacular Likomo Island and the Chizumulu Island inhabited in Lake Malawi. Accommodation at Lake Malawi is widely available and includes cottages, hotels, camping sites, beach resorts and many more. Activities to do at Lake Malawi would include swimming, diving, snorkelling, various water sports, kayaking, sailing, scuba diving, water skiing, beach walks and many more. The majestic Zomba Plateau is a huge mountain rising to 1800m with magnificent views of abundant streams, still lakes, waterfalls and mixed wild vegetation with Cypress, Pine and Cedar Trees. Wild- and birdlife in the Zomba Plateau will include giant butterflies, leopards, baboons, Augur Buzzards, Long-crested Eagles and many more. Accommodation on the plateau includes a luxury hotel, a large camping site and a forest lodge. Activities to do in the Zomba Plateau will include, Walking trips, Driving tracks, Fly-fishing, Horse riding and many more. BirdLife Malawi strives to conserve Malawi’s birds and their habitats. A welfare and conservation charity dedicated to protecting Malawi’s wildlife and habitats. The wildlife and environmental society of Malawi has been dedicated to protecting Malawi’s remarkable diversity of animals and habitats. Wildlife Action Group is dedicated to the conservation of African Elephants, Wildlife and the environment in Malawi. Please be aware that the information noted below is applicable to tourist visas only. If you’re planning on working, studying, volunteering or living in Malawi, you’ll need a different type of visa altogether that requires additional documentation and must be applied for in advance. You can contact your embassy for more information. A collection of useful phrases in Chichewa, a Bantu language spoken in Malawi, Zambia, Mozambique and Zimbabwe. The language is known as Chewa (chichewa) in Malawi, and Nyanja (chinyanja) in Zambia and Mozambique. Translations have been kindly supplied by Simon Ager at Omniglot. Reply to ‘How are you?’ Zimkomo, kaya inu? What’s your name? Dzina lanu ndani? Where are you from? Mumachokera kuti? Do you speak English? Mumalankhula chizungu? Do you speak Chichewa? Mumalankhula chichewa? How do you say … in Chichewa? Mumati chiyani … mu Chichewa? How much is this? Ndalama zingati? Where’s the toilet? Chimbudzi chili kuti? Would you like to dance with me? Ungafune kuvina ndi ine? Call the police! Itanani a police! Malawi has a sub-tropical climate, with mostly hot and humid summers and mild winters. The average summer temperatures in Malawi is between 20°C to 32°C and the average winter temperatures in Malawi is between 15°C to 28°C. The rainy season in Malawi is generally from December to March. Annual average rainfall in Malawi varies from 725mm to 2,500mm with Lilongwe having an average of 900mm, Blantyre 1,127mm, Mzuzu 1,289mm and Zomba 1,433mm. The cool and dry winter season in Malawi is from May to August and the temperature varies between 17°C and 27°C. During this time, temperatures may fall between 4°C and 10°C and frost may occur in isolated areas in June and July. There is a hot and dry period that lasts from September to October with average temperatures varying between 25 and 37 degrees Celsius. Humidity in Malawi ranges from 50% to 87% for the drier months (September/October) and wetter months (January/February) respectively. From April to November the temperature is warm with equatorial rains and thunderstorms. Most people prefer to visit Malawi in the dry season (April / May to October / November) as game viewing is at its best during this time.